Doubled made 12 demi-tasse cups Smooth, rich chocolate. Fast and easy, made in the blender or food processor. 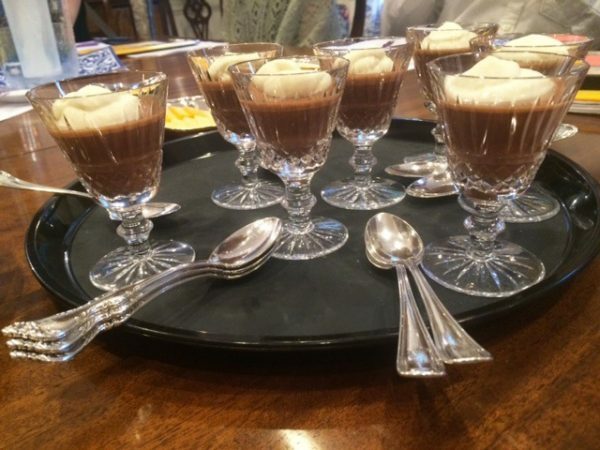 Serve in little pots or in glass goblets. We took a trayful of them to a party and everyone loved them! Heat milk slowly, just to boiling point. Put all other ingredients except rum and whipped cream into blender or food processor. Slowly add hot milk and blend for 30 seconds. Add rum and continue blending 1 more minute. Pour into serving dishes and chill. Serve with a dollop of whipped cream. Note: if doubling the recipe do not use 2 eggs. One egg is fine.